Each pyramid is handcrafted from a single piece of Authentic Shungite in Russia. They are used as an extra layer of protection against electromagnetic radiation. Also, Shungite is considered to be a good water purifier and serves this purpose for centuries. E.g., a 5x5cm2 pyramid purifies approx. 850ml of water, 7x7cm2 - 2.5 litres, 10x10cm2 - 6.5 litres. Photography © Irene & Mr. Sheep® Co. 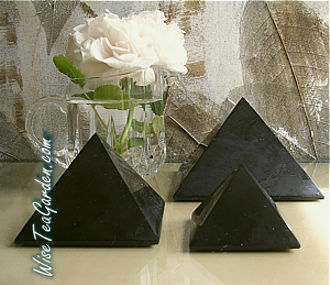 IN STOCK: Shungite Pyramids of 5cm, 7cm, 10cm height. Base dimensions: 50x50mm2 and 5cm height, 70x70mm2 and 7cm height, 100x100mm2 and 10cm height. Self-adhesive: remove a layer of a film, and attach a plate to the center of the reverse side of a cell phone. Dimensions: 15mm x 25mm x 3mm. 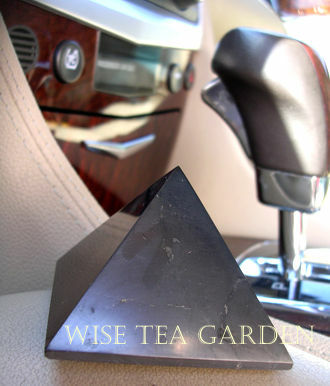 Put a Shungite Pyramid in your car or under your office desk for an extra layer of protection against electromagnetic radiation. 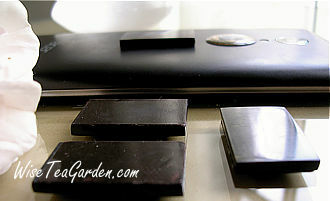 A Shungite Plate for a cell phone can also be put in your bag or pocket. VIDEO: How effective is Shungite against Electromagnetic Radiation?